Big Brother Tony and Little Brother Jahmir were matched in our Community- Based mentoring program. With no father figure in his life, Jahmir’s mom, Marla, wanted her son to have a positive male role model. At the start of their match, 12-year-old Jahmir was going to summer school for math, but really wanted to focus on his basketball skills with his Big Brother. Through communication with Marla, Tony learned about target areas for improvement with his Little and made an effort to remind Jahmir why making school a top priority is important. “Jahmir was always a good student, but as he got older, he wasn’t doing quite as well. Tony will ask him how he’s doing and keep up with his progress in school, which helps both his grades and attitude,” said Jahmir’s mother, Marla. The match made a deal in which they would work on math a little bit before they played basketball during their visits. This way, they would get to have fun while still allowing time for schoolwork. One day, Tony went to pick up his Little for an outing and Jahmir proudly answered the door holding a Student of the Month certificate. Jahmir’s teacher had recognized his improvement in math and good behavior and rewarded him for such great progress. The icing on the cake came that afternoon, when the two went to play basketball at their usual spot near Tony’s house, and some kids approached them and asked if they could play with them. 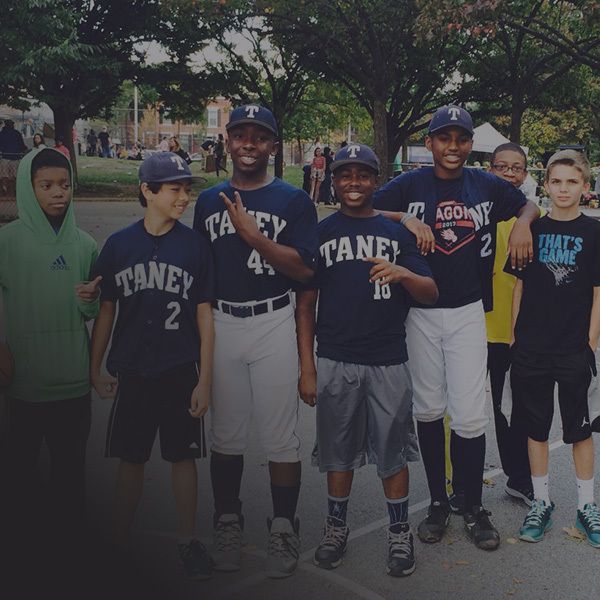 It was then that Tony and Jahmir noticed that they were members of the championship Taney Dragons baseball team! Jahmir had a huge smile on his face all day. They even got a photo of Jahmir and the team together. A big thank you to our dedicated volunteer mentors, like Tony, for setting children on the path to bright futures.